Last year I worked on a project with Robyn Chachula. 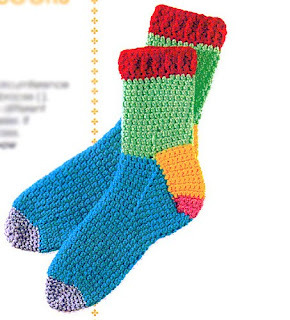 It was actually the second project that year (the first was in the book Simply Crochet: 22 Stylish Designs for Everyday , out now). I was very excited about this project because I got to work with a scrumptious yarn and work in my favorite technique – lace. You can see a bit of my design here on the cover (it’s the hot pink blanket in the top left corner). So I didn’t get a lot of things while at Chain Link. Coming in to Buffalo, my checked luggage was at 47.3 pounds. So I didn’t have a lot of room to play with. I also won a door prize! A Tahki Stacey Charles pattern book (that I’ve wanted for a while) and 9 skeins of Tahki Cotton Classic. There’s a Doris Chan pattern in there that I wanted to make and I have just enough yarn for it! How awesome is that? On Thursday after the Getting Loopy show, we ran over to the market preview where Mary Beth Temple was signing books at the Leisure Arts booth. Leisure Arts was giving away copies of the book! I was stoked about this since I had planned on buying it anyway! Yes, it came with all the hooks from D to J (including the 2 sizes of G), a pair of really sharp scissors, a hard ruler, and 2 needles. There’s room for 2 more hooks if I move the scissors to the zippered section. Saturday after the Meet and Greet we stood in line for Drew’s book signing. Again, Leisure Arts was giving away books. They were totally random but it worked out great! Margarita got a hat book and I got the pet book. I also picked up a pair of crochet earrings on Saturday in our last run through the market before heading down to the dinner. Aren’t they cute? The last thing I got was at the dinner on Saturday night. There were double ended hooks and knitting needles on the chairs. I grabbed a seat with a hook. It’s a G double ended hook which I can use as a Tunisian hook by simply putting a stopper on the other end. Today I got a nice surprise via UPS. My copy of Granny Square Wear!!! And let me just say how excited I am about this book. See, to me, it’s a book because it has a spine. An actual spine! 😀 Yes, it’s the little things that thrill me! 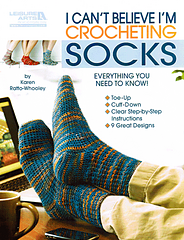 There are another 8 patterns in the book and they’re all fabulous! I’m among great designers and that makes me happy. Well, I can now tell you what it turned out to be…. 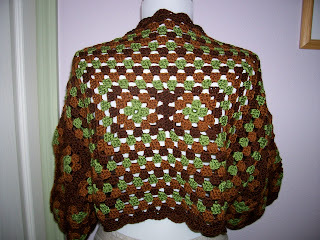 It’s in the new book out by Annie’s Attic called Granny Square Wear. Now I will be stalking the mailbox for my copy to show up. This is a fun project and I’ll be wearing one at the Fashion Show at the CGOA conference. And for an idea of how long it took me to make it, I did the sample in a day and a half while at a “grownup slumber party”. Okay, I have to get back to work. Another project due to go out the door by the end of the week. Later…. 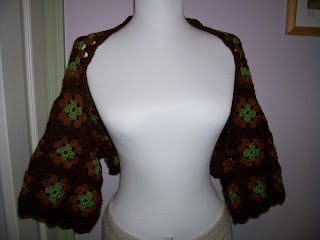 …another pattern by me in the CLF book! Just got word today that my pattern I submitted for the CLF’s 2nd book – Crochet in Chains: The CLF All Growed Up – has been accepted. I’m not going to show you a picture or even tell you what it is (keeping in theme with the “adult” nature of the book, I’m just gonna tease), but I will say that it is a really neat project. I will say that it might include beads and thread again. 🙂 And that it will make a great gift for yourself or someone else. The rest of it, you have to wait until the Fearless Leader says I can say more. This book will be smaller than the last one, and therefore less pricey. Fearless Leader has learned a lot in the publishing of the first book, so fingers crossed this one goes quicker and easier on her! And of course I’ll be posting updates as I get them and I’ll let everyone know when the book is ready! Now I need to get off my duff and type up my submission for the 3rd book (yes, we have many planned) and get that submitted. Whew, been a busy morning already. I finished the main crocheting on SSP#4 on Friday night, so I can take this week off guilt free. While I have 2 more small things to make to go with it, I will likely do that today. I’m not going to ship until after the holidays so it doesn’t get lost during the mail rush. Today I needed to whip up some quick gifts to send to Nelcy and Ray up in NJ. My original plans got shot down simply due to time. I will likely still do them and have them ready for either birthdays or next year. 🙂 I was going to just do some ornaments and such, but found a great pattern last night and decided to do that instead. It’s the Crochet Beaded Bracelet (Ravelry Link). It worked up very fast. I may be making a few more since it was so fast and easy. For Ray, I sent up a hat I had in my “made it, don’t know what to do with it” bin. I hope he likes it. It’s the Skater Hat (Ravelry Link). After getting those done, I whipped up a small ornament (no pic, sorry) and packaged them up and sent Priority Mail to NJ. Hopefully they get there by Wednesday. If not, then at least it should reach them by the end of this week. Today’s plan? I have one more pair of socks left to make. I finished the 3rd pair last night. Then I need to finish my niece’s dress. Then I’m done other than working on John’s vest. I’m in a good place, I think. John’s vest likely won’t get done by Christmas, but if I can get it done by the time he leaves next Sunday, then I’ll be happy. He said it was 34 when he got into the hotel last night. Today’s delivery people (not mail, it’s not here yet) brought me 2 books: Crocheting on the Edge and Amigurumi Animals from Crafter’s Choice (LOVE them…I got one of them for free) and yarn for the next project to be published. Yay! That project will start as soon as I wrap up SSP#4 and get it sent. It’s hard to blog when nothing can be shown or talked about! 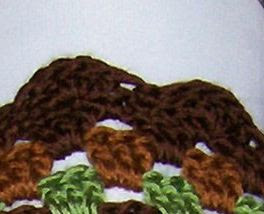 I’ve been crocheting away the last few days but I can’t show you any of it! I’m making great progress on SSP#4. Hopefully it will be done and out the door by the end of this week. Another way he’s a good guy? He called me Friday from the mall near the airport. He was at the bookstore and wanted to know what crochet magazines I needed. I had already picked up the new Crochet Today (at my grocery store!) and I get Crochet! through subscription. Interweave Crochet isn’t out yet (although it looks REALLY COOL this month). So that left Crochet World. So he found one and brought it home to me. 🙂 Yay! I did get a new book yesterday. It’s Rowan’s Crochet Workshop. Good book if you teach or you know a beginner who could use clear pictures. I’m likely loaning mine to my friend Mare since she’s a new crocheter. I also got a neat messenger bag at the same time (I buy my books through Crafter’s Choice). I’m going to make a CLF patch (pattern is in the CLF First Ever Book) and sew it on there. 🙂 The bag is olive drab green so it should work out. Okay, I need to get back to sock making or I won’t make my deadlines. 🙂 Hope everyone had a great weekend.